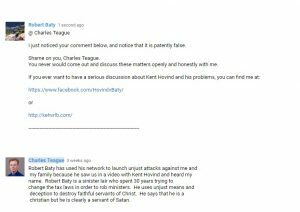 Kent Hovind – Charles Teague – Child Endangerment – Kent Hovind v. Robert Baty – The Great Debates! I just noticed that Charles Teague made another false and/or misleading comment about me some time ago and so I want to archive some of that history here; for the record. I just noticed he took a cheap shot at me some time ago, and so I posted a response. I think Teague may have also deleted one or more of my messages that had been posted to that video of his. Some may recall that I never could get Charles to come out, come clean, and openly and honestly talk to me. – “The comments below mention my name. – They are complete lies. I would be more than glad to edit or remove any lies that you can identify in my comments, if that is what you had reference to. Like a good Hovindicator, you pop off here and make charges against unnamed people and without anything to support them. You should know better; I think you do. As Kent would say, you need to deal with specifics. If you do so, we might advance this conversation and clear the air about anything I might have posted that you find objectionable. Otherwise, how about helping influence Kent to come out to me and discuss his legal problems! The comments below mention my name. I demand that you remove them. It seems you posted those same comments earlier and when I responded you ran off. That might be a good place for Mr. Teague to start if he thinks what I wrote is a “complete lie”. I copy this here just in case you are not following the other conversation about you where your female admirer is trying to cover for you as if you are just not man enough to speak up for yourself and your “complete lies” claim. Still trying to cover for the cowardly Charles Teague I see, Ms. Moore (aka Herbielina). I think you may have embarrassed him even further, but he needs to know he can still repent or attempt to justify his claim so the matter can be appropriately resolved. As you know full well, Ms. Moore, he did not just ask that the comments (whatever they were he did not say) be removed. No, he claimed the reason he was asking was because they were “complete lies”. Kent and his people don’t get to go around making ipse dixit claims like that and expect everyone else to roll-over and do their bidding. Well, actually, as this page illustrates, I guess Kent and his people are so pig-headed and “arrogant”, to coin a term Kent discussed in his recent video, that they do actually go around making false and/or misleading claims and demanding others do their bidding as if God were the one asking. So, Mr. Teague, if you are not going to come out and try to justify your claim so that any, if any, “lie” can be corrected, why don’t you call off Ms. Moore; hasn’t she embarrassed you enough. Some who follow Kent’s antics may have noted how he has been calling for his followers to send or bring their children to his commercial construction site at 488 Pearl Lane near Lenox, AL in order that they might be put to work on the many and varied construction projects currently under way, in exchange for a little room and board and maybe some free time on a four-wheeler. It may be important to note that the property, the 150 acre site, is apparently owned not by Kent Hovind but by nominee corporations whose investors and promoters remain very much secret. In Kent’s latest video he featured a fore-lorn looking computer geek from Texas, Charles Teague, who had showed up with his 7 kids and very pregnant wife. In earlier videos Kent had boasted of others who had brought their kids and put them to work at the construction sites. In that context, some might reasonably be concerned about the safety of those children, without regard to the potential sexual abuse that often times accompanies such compounds as Kent is developing. If so, I have listed below the relevant links to the Alabama Child Protective Services websites with the last one being the page for sending in concerns about children or circumstances that may be appropriate to investigate. You are encouraged to let the Conecuh County Child Protective Services authorities know of any concerns you may wish to express. Mr. Teague has returned to Kent’s Kompound and posted 2 more short videos promoting it. property east cross the road from Kent Hovind’s place.